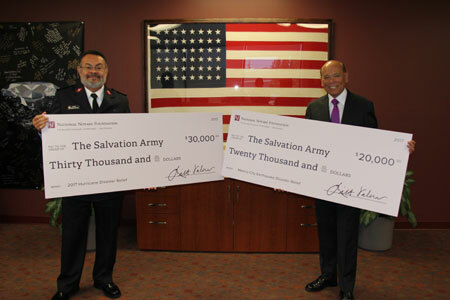 Thanks to the generosity of Notaries across the country, the National Notary Foundation presented $50,000 to The Salvation Army on November 29 to support relief efforts for victims of the devastating hurricanes last summer and the disastrous Mexico City earthquake. Responding to the call for aid, Notaries offered thousands of dollars in donations for disaster relief that were matched by the National Notary Foundation, the NNA’s philanthropic arm. 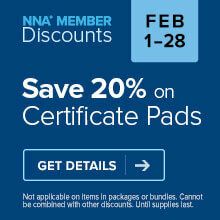 The NNA also donated 100 percent of the proceeds from recent sales of Texas and Florida Notary journals. Altogether, $30,000 was raised for hurricane victims and $20,000 to support post-earthquake relief in Mexico City. Robert Brennan, director of communications for The Salvation Army’s Southern California Division, thanked Notaries for all their efforts. “The money Notaries have raised will go directly for clothing, food and clean water for people at disaster sites. It’s an amazing gift,” he said. In recent years, the Salvation Army has come under fire for its lengthy history of anti-LGBT political maneuvering and other incidents. The church has publicly articulated its belief that homosexuality is unacceptable, stating: Scripture opposes homosexual practices by direct comment and also by clearly implied disapproval. The Bible treats such practices as self-evidently abnormal. ... Attempts to establish or promote such relationships as viable alternatives to heterosexually-based family life do not conform to God’s will for society. While such statements were recently removed from the Salvation Army’s website, the church has yet to repudiate any of its explicitly anti-gay beliefs. And though these positions may seem to be limited to the group’s internal doctrines, they’ve become a persistent element of the church’s overtly political activities — activities which have negatively impacted the Salvation Army’s ability to provide charitable services, and have aimed to limit the rights and benefits of LGBT citizens in multiple nations. I hope the NNA does not share the beliefs of the Salvation army and in the future they research into whom they are supporting.